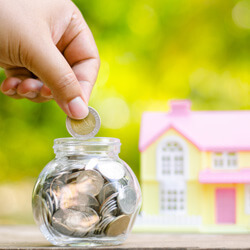 At the risk of stating the obvious, the bigger the down payment, the smaller the mortgage, which in turn saves you a considerable amount of money in interest costs. But, how much in savings on interest are we really talking about? The sale price of the home you want to buy is $470,253—the average price of a home in Canada as reported this past January by the Canadian Real Estate Association. The mortgage loan insurance premiums (if required) are the new premiums effective March 17, 2017. The mortgage loan insurance premiums will be added to the mortgage loan. Mortgage payments are made monthly. Using the Government of Canada's mortgage tool that tallies up the total cost of a mortgage, the following shows the difference in interest paid depending on the size of the down payment we put on our $470,253 home. The difference between saving a five per cent down payment and a 20 per cent down payment for the same house is almost $50,000 in interest paid over the lifetime of your mortgage! Not to mention, the thousands of dollars you save by not having to purchase mortgage loan insurance. The more you save for your down payment now, the more money you'll save over the years. Much like down payments, every percent counts when it comes to mortgage rates. Compare mortgage rates from 30+ financial partners at Kanetix.ca, and easily connect with the lender for your best rate.